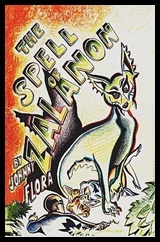 Giant killer cats, an ancient spell and a world doomed to the fate caused by the excessive lifestyles of the human race make for a very interesting read in Johnny Flora's debut novel, The Spell of Zalanon. As expected, this story was full of suspense and progressed fairly quickly, once you get past the initial backstory and learn the details behind the ancient spell of a powerful sorcerer named Zalanon. I love the originality of this story. The concept of house cats being the product of an ancient spell that would someday reverse to reduce the size of the human population is one I've never seen done before and it was intriguing to say the least. When Zalanon's ancient spell is reversed, all the house cats in the world turn back into the giant killer cats they once were to bring balance back to a world nearly destroyed by the uncaring humans who inhabit it. It doesn't take long for life on Earth to become chaos once these massive, monster cats start popping up all over the world. The situation only worsens when everyone realizes that they are no longer the superior race. Those sweet, loving little kitties they've kept cooped up all this time have become blood thirsty predators... and their preference for a mid-day snack is the fat, fleshy humans they've been co-habitating with. This is certainly a setting for some really gory moments, and Flora definitely delivers the gore. Not one to shy away from the bloodier side of literature, I appreciate the fact that certain situations and occurences in a book like this weren't sugarcoated. By no means does this take away from the fact that The Spell of Zalanon and Johnny Flora's killer cats make for a good, solid story, being that it's the authors first foray into the world of fiction. Honestly, it was quite refreshing to read a completely original story for a change. If you enjoy horror stories, killer cats, fantasy books or even a little science fiction, you should check this one out. I can promise you that you'll never read another book like it. "Jersey" Johnny Flora is a professional musician who currently resides at the Jersey Shore with his wife Debbie and their five children; John, Justin, Jimmy, Kristen, and Gabrielle. The Spell of Zalanon is his first fiction novel and he is working on a terror suspense novel soon to be released for publication.